25.1E, 25.2, 25.5, 10.2, 2.5B. Chassis Specialist and Consultant, Track Set up and assistance. Racing help at the track. Racing lessons available with your car, heads up and full tree. 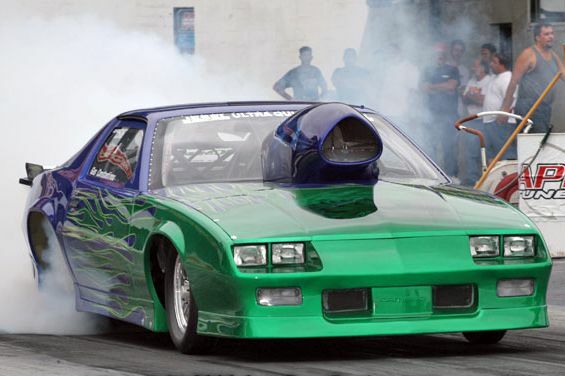 Sponsorship opportunities are available for the 2011 Race Season, NHRA PRO, NHRA UnLeashed and Outlaw Drag Racing packages* 8 wins from JCM Racing in 2010!.7 wins from JCM Racing in 2011 * 7 wins so far for JCM Racing in 2012* Packages range from single race Sponsorships to multi-race or multi-year programs. Sign early and get the best deal! Click HERE for details. We have the right advertising program for you. ***************************************************************************************** Continue to support the United States Armed Forces in all operations, and congratulations to all armed forces members for killing the worlds most wanted terrorist! JCM Racing Thanks You!. Sept 20, 2014. 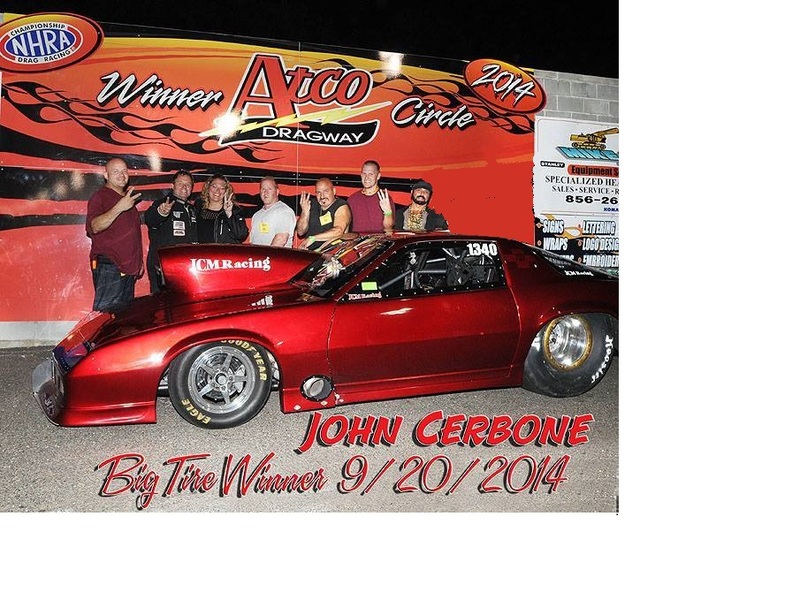 John Cerbone WINS THREE IN A ROW! 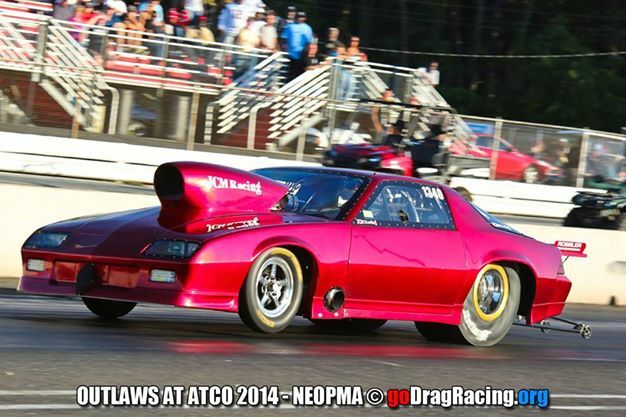 John Cerbone, Gus Constantinou Win Race #3 in the Big Tire Outlaw Series at Atco NJ. Race reports to follow shortly. Jun 21 , 2014. John Cerbone WINS TWO IN A ROW! John Cerbone, Gus Constantinou Win Race #2 in the Big Tire Outlaw Series at Atco NJ. June 14th, 15th, 2014. 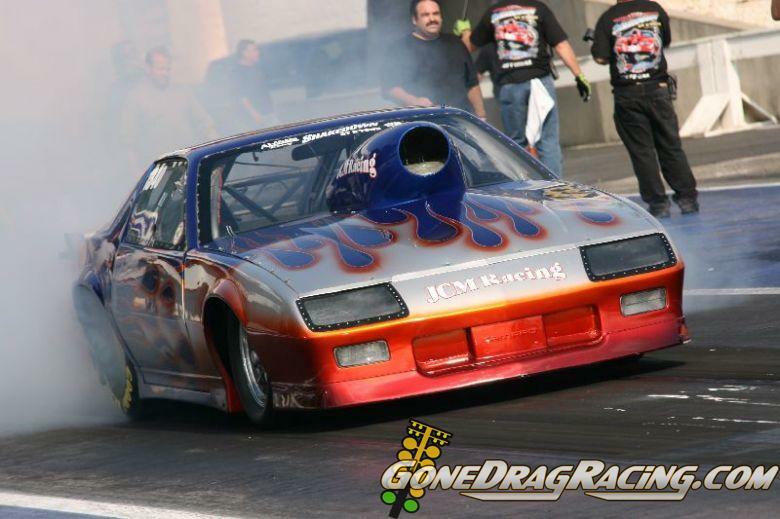 John Cerbone WINS AT ENGLISHTOWN! John Cerbone, Gus Constantinou Win Race #1 in the Big Tire Outlaw Series at Old Bridge Township raceway park NJ. Sept 15, 2012. John Cerbone WINS THREE IN A ROW! 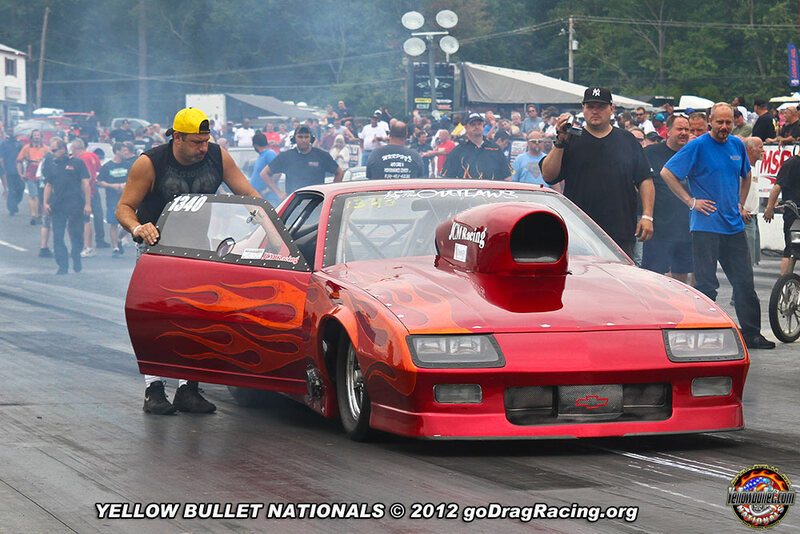 John Cerbone, Gus Constantinou Win Race #3 in the BigTireOutlaw.com Series at Raceway Park Englishtown NJ. 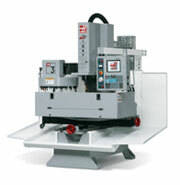 JCM Racing Doubles Up. 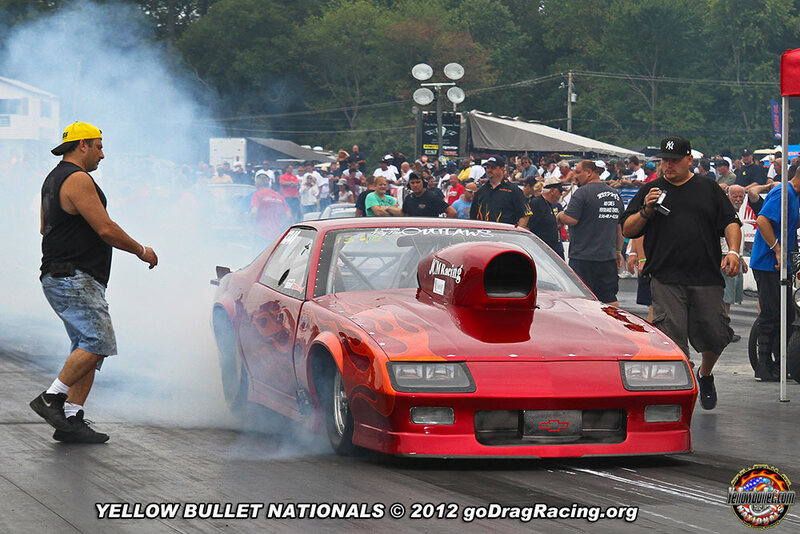 Shawn Gallagher Wins the 8.50 Index race at Raceway Park Englishtown NJ. Sept 2, 2012. John Cerbone WINS! 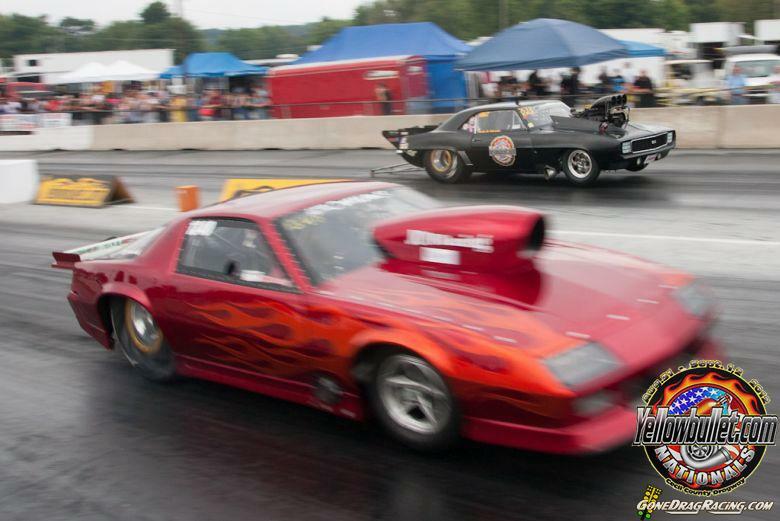 the Yellow Bullet Nationals at Cecil County Dragway in Rising Sun Maryland. 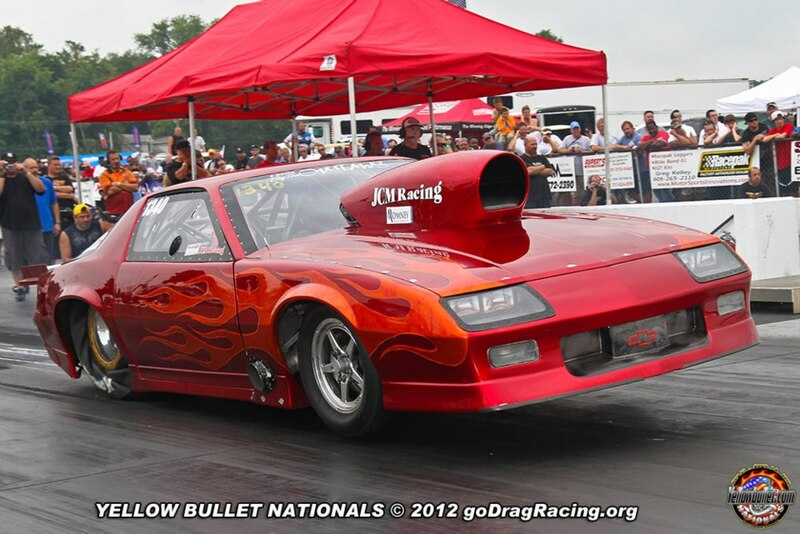 John Cerbone qualified #2 at the Yellow Bullet Naitionals running as fast as a 4.43 at 164mph in the 1/8th mile race. John, Car Owner and crew chief Gus Constantinou and Crew ran a great race working harder than ever to win this tough Outlaw race. Even changing pistons between rounds couldn't slow down this team who had the Engine apart twice that weekend. John did his job driving with lights of .040, ,002, 017, and .0052 for the win! runs of 4.50, 4.43, 4.46, and 4.52 to take the title. John and Gus Thank John's wife Pattie, Crew Brian, Jeanine, Gill and Anthony for their hard work. He also thanks Chris Kraft and his Crew Chief Ben for coming down to help crew for this race. "these guys worked harder than ever before to win this race". Yellow Bullet Nationals, John Cerbone winning runs here. Aug 19, 2012. John Cerbone WINS! race #2 in the 2012 BigTireOutlaws.com race at Raceway Park NJ. John Cerbone qualified #2 at the 2nd 2012 BigTireOutlaws.com race at Raceway Park NJ. John, driving Gus Constantinou's JCM Racing built 25.2 Camaro. John and Gus used each run to ease up on the final round with runs right around 4.50. 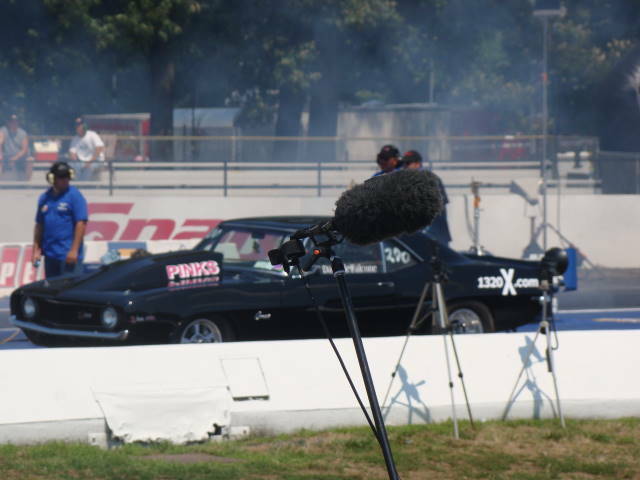 With the final being the last test of the day for the JCM team up against the Big Bad Blown camaro of Tom Tarsia. Both John and Gus tuned the camaro, then tuned it again throwing everything at it they had for the day. 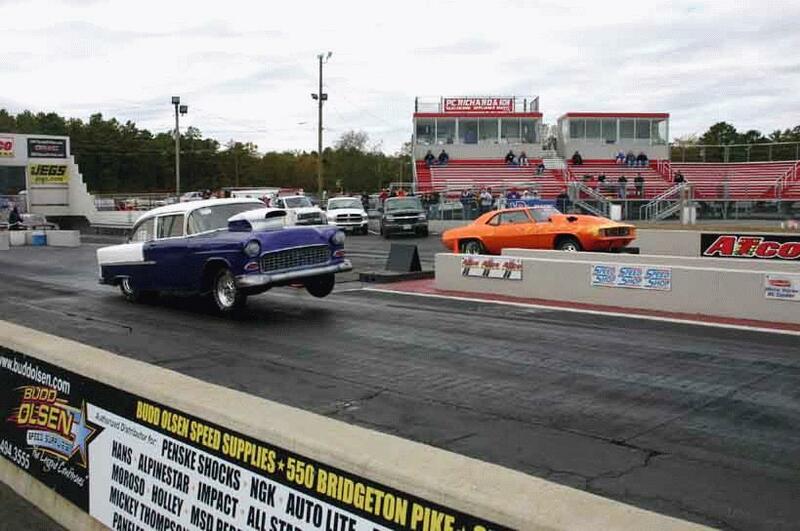 They came up on top, winning big with a great 4.42 against a 4.39 for the blown camaro. The deciding factor was John's .05 better light winning on a holeshot! 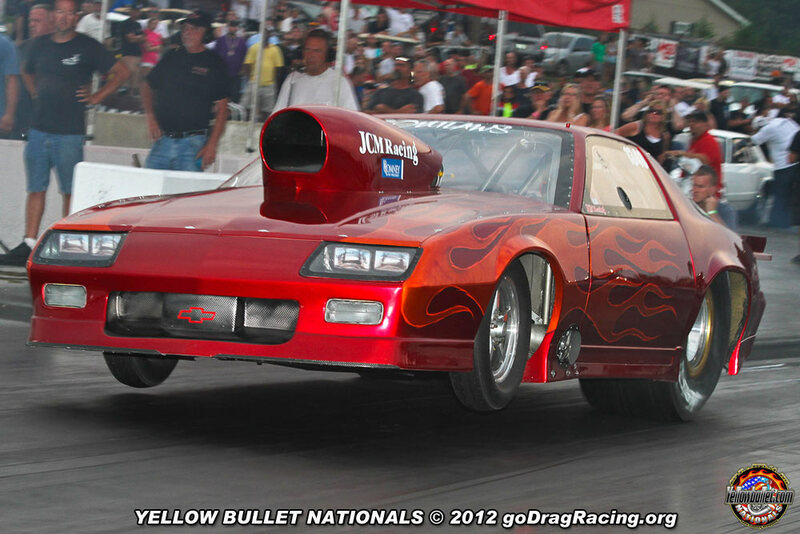 BigTireOutlaws.com John Cerbone 4.42 164 mph wining pass here. Oct 2 and 3, 2011. John Cerbone quaifies #2 at the final BigTireOutlaws.com at the Shakedown and E-Town race at Raceway Park NJ. John Cerbone driving Gus Constantinous JCM Racing built 25.2 Camaro sliced off a big run at 3000lbs with a 598ci engine hitting a 4.47 et at 161 mph in the 1/8 mile race giving them the #1 spot. Then the duo backed it up again for th night session but this time leaving the Camaro #2 for qualifying. BigTireOutlaws.com John Cerbone 4.47 161mph #2 qualifying pass here. Sept 18, 2011. John Cerbone quaifies #1 at the final BigTireOutlaws.com race at Raceway Park NJ. John Cerbone driving Gus Constantinous JCM Racing built 25.2 Camaro sliced off a big run at 3000lbs with a 598ci engine hitting a 4.46 et at 160 mph in the 1/8 mile race. BigTireOutlaws.com John Cerbone 4.46 160mph #1 qualifying pass here. John Testing his new JCM Racing built 4 Link Dragster with the JCM Racing built 434ci small block Chevy Engine. John Hit two perfect .000 lights and a best of 7.98 et. John said "the car is perfect". 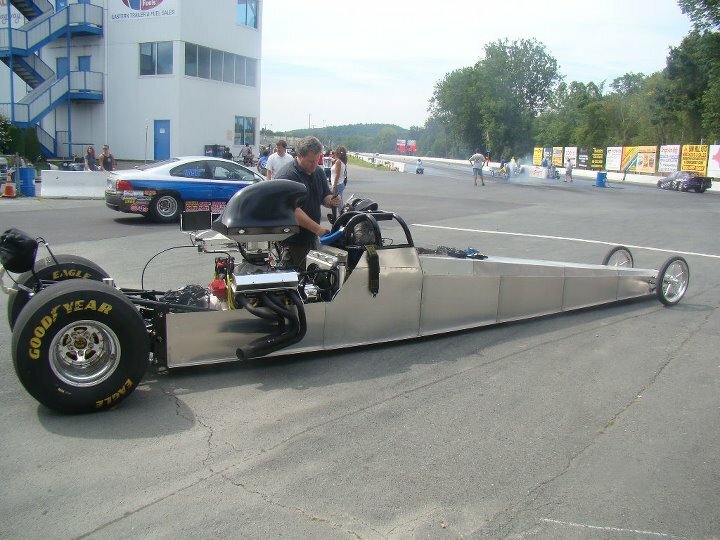 John JCM Racing Built dragster 7.98 pass here. July 31, 2011. John Cerbone Takes Second at the Big Tire Outlaws Race at Raceeway Park NJ. 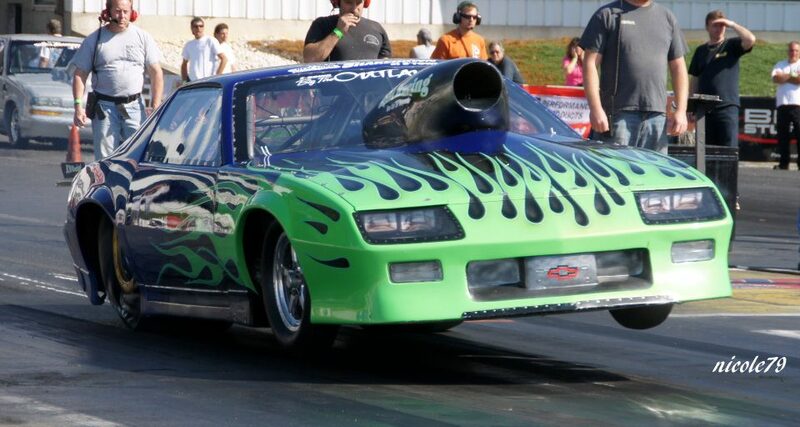 John Cerbone Ended the day with a runner up finish driving gus Constantinou's Big Tire Camaro in Raceway Park's Big Tire Outlaws Race last sunday. John and Gus set the pace qualifying in the top stop grabbing #1 in the first session with a 7.22 195 mph run. The second session of qualifying had the same result with The JCM Racing /Gus and Nick's Auto body Camaro fastest again. with a 7.24 195 mph. First round of competition John Ran a very fast Rick Righter driving a Comet with John taking the win. Second round the JCM Racing Camaro had the tough and consistant Richard Scioscia in his Super nice Baracuda. John was able to get by Scioscia even though he encountered a faulty burst plate on start up. John legged it to the line, and got the camaro to the end under power winning second round. 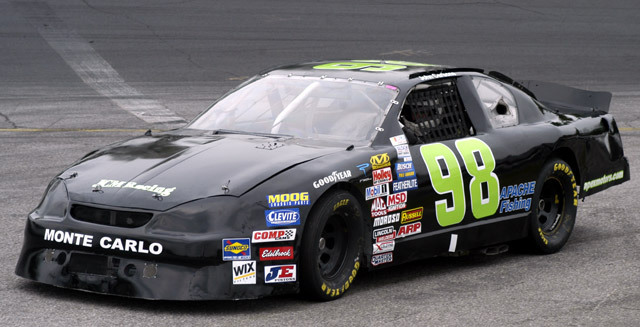 Third round would bring John Schroeder's 99 camaro and the toughest race of the day. Schroeder would bring his best light of the day .031 and a 7.361 to Cerbone's .061 7.341 and take the win light by .01. So Cerbone would have to settle for second. 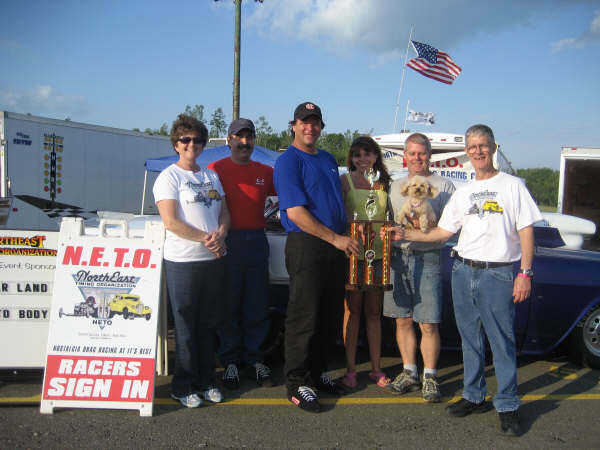 May 1, 2011 Chris Kraft Wins NETO First race of 2011 in NJ! 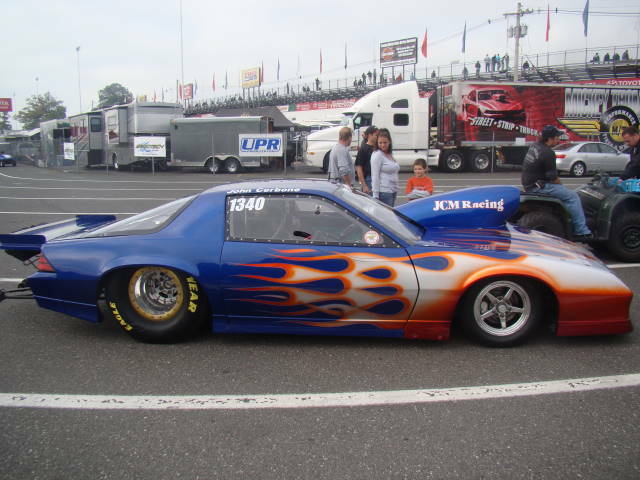 Chris Kraft took on the 2011 Racing Season with a win at Island Dragway in NJ. Chris, and crew chief Ben Doyle arrived prepared in NJ right out of JCM Racing from a winter freshing of the chassis with some new components and setup. 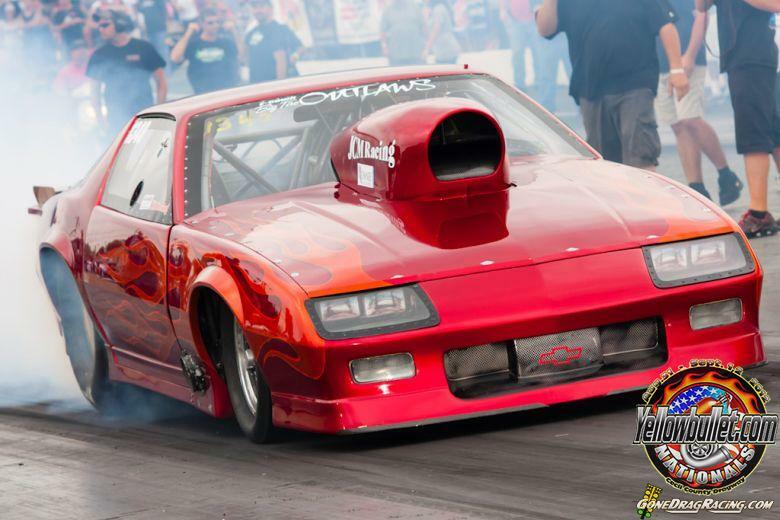 Chris and Bed took the freshened chassis and components to their shop and completed assembly and setup for the new season and it paid off innediately with a win in the pro comp class of the NETO race series. 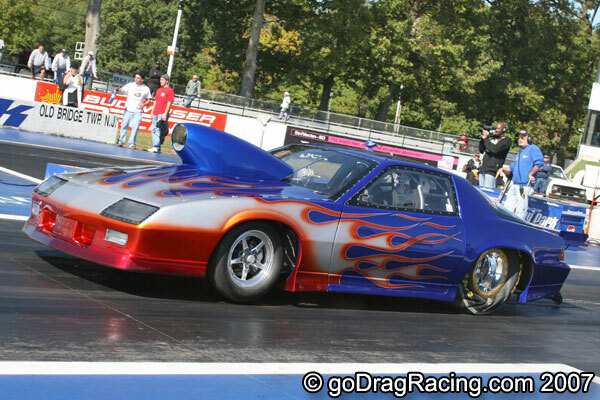 Chris took out a tough Chevy monza with a supercharged hemi first round with an 8.56 et on an 8.50 dial in. 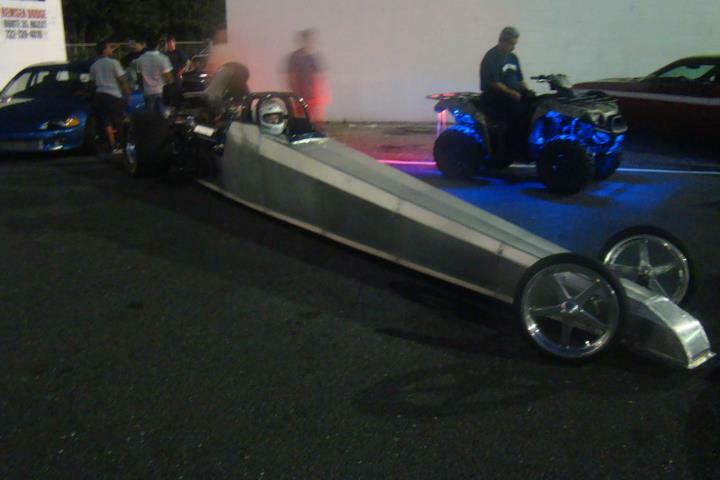 Second round chris ran another 8.56 on a the 8.50 dial in against a front engined dragster powered by a big chevy engine. 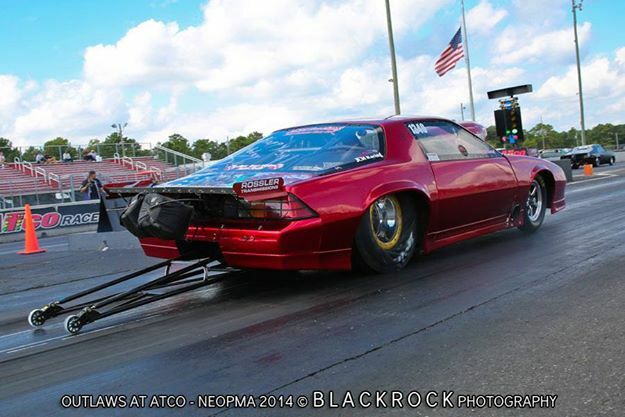 Third round chris hit the tree with a .017 reaction time to trailer a big block powered vega taking the win and showing the NETO crowd how its done! Grabbing the points lead and a bonus 25 points for the best reaction time, chris heads into the next race top in points. Chris gave special thanks to his Win to JCM Racing, and Crew Cheif Ben Doyle for a spectacular job . More photos here in Chris Kraft Photo page. 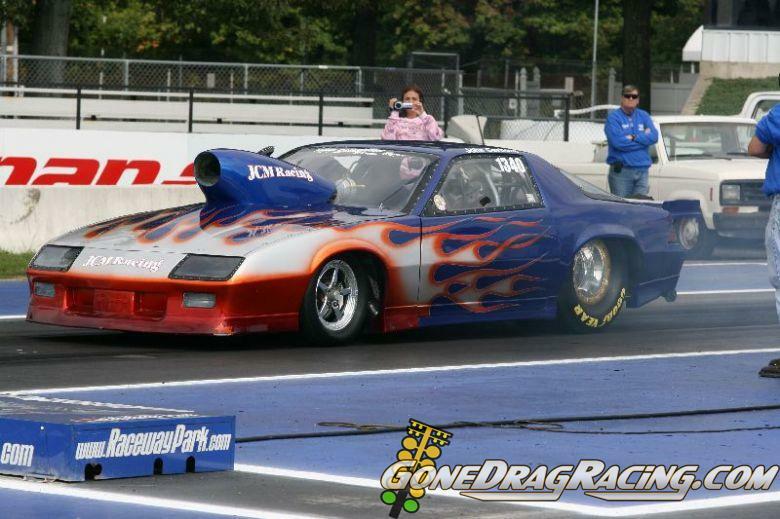 Oct 1, 2, 3, 2010 John Cerbone #3 qualifier and semi final finish at the Shakedown and E-town! John Cerbone's semi final finish at the Shakedown at E-town . 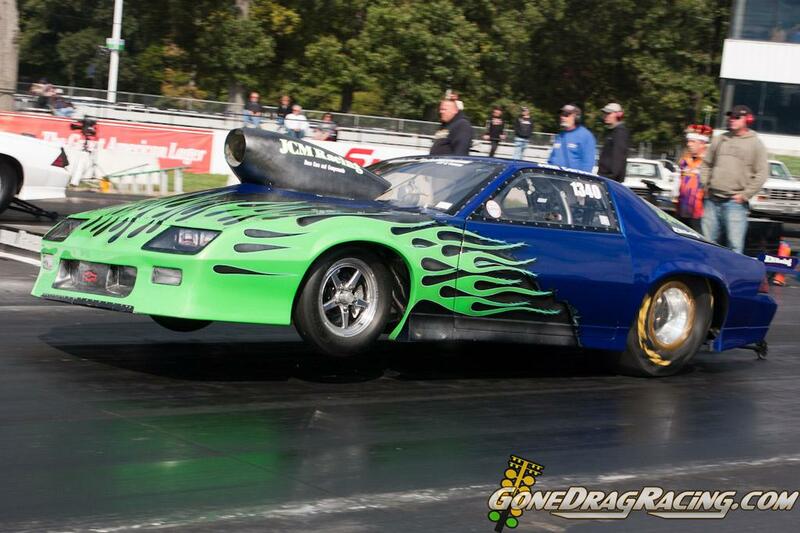 this past weekend in Gus Constantinou's JCM Racing H/S Camaro. 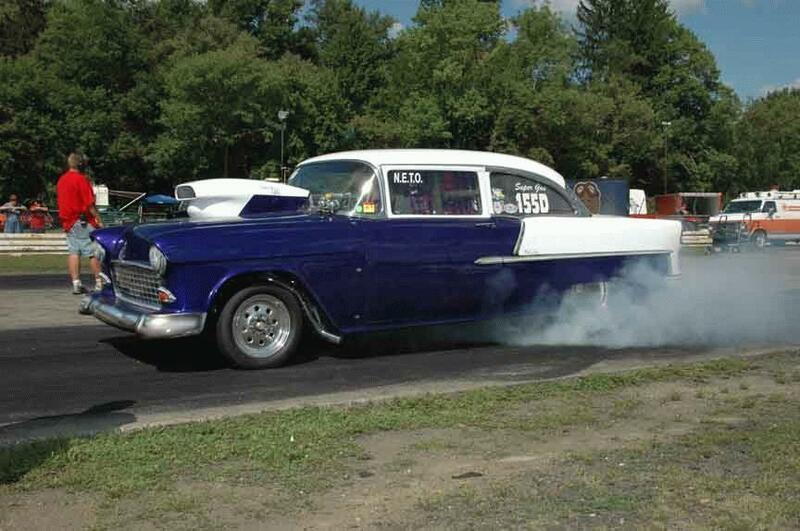 Powered by a 598 ci engine and supported by Speedtech Nitrous, the car made runs of 7.08 to 6.98 all at 199 to 202mph. 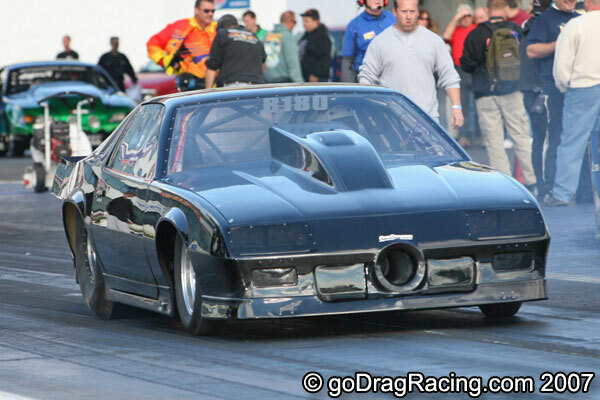 Two qualifying runs made on saturday of 7.08 at 199mph, and 7.04 at 199mph all at 3030lbs. Sundays first round was uneventful with John beating his opponent on the tree by .10 and out running him by over .4 to the finish. Second round was somewhat tougher, but John Still took .01 win on the tree and out ran his second round opponent by over 2 tenths. third round found John and JCM Racing running the eventual winner. 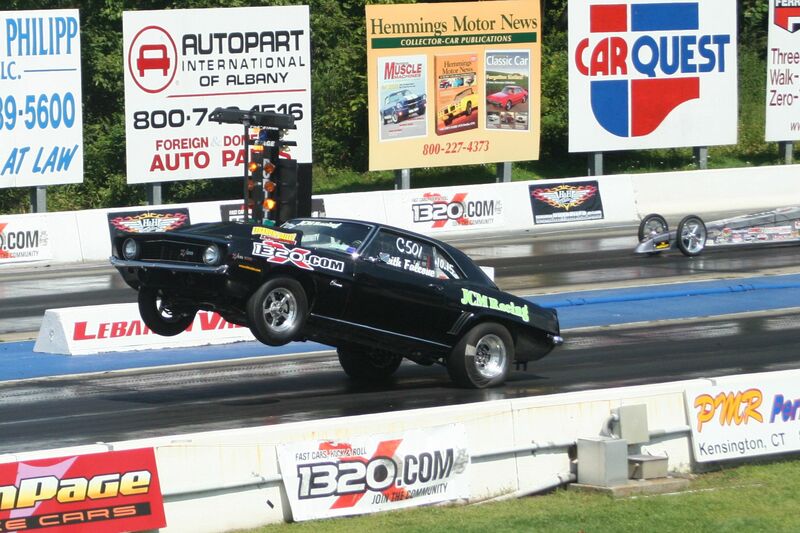 John Hit him on the tree and ran the cars best ET ever, a 6.98 but it was just short of the bigger motors (762) 6.92. John said "we slipped the tire in the tricky right lane and lost about 2 or 3 hundreds". and that was what was needed to win as the finish line number was .027 of a second loss. Still up about the event, the team was happy with the race saying "we only made one run in that car in the last year. The last time we made a run was the last shakedown in 2009" so basically we were testing at the 2010 race. John gave special thanks to his semi final finish to JCM Racing, Gus Constantiou of Gus and Nicks Auto Body, and G and C Pro Trans. 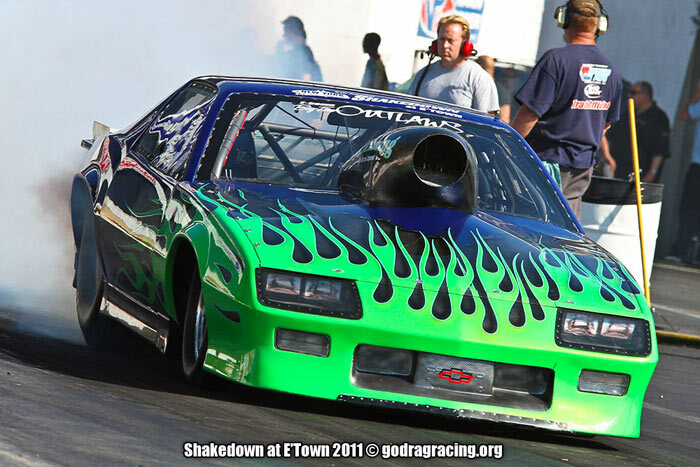 More photos here in Shakedown 2010 photo page. Shakedown 2010 H/S Videos here. Shakedown 2010 qualifying #2 7.04 199mph Videos Shakedown 2010 race round 2 7.03 199 Videos Shakedown 2010 6.98 202mph Videos here. August 13,and 27, 2010 Shawn Gallagher runner up and Wins at Raceway Park NJ! Still another runner up and another Win in 8.50 for Shawn Gallagher at Raceway Park, Old Bridge Township Raceway Park New Jersey. Shawn and John Gallagher tuned their way to a runner up and a win with driving skills, consistant lights and great tune ups his JCM Racing tuned chassis. That's 4 wins and two runner up finishes in 8 races for Shawn and the 7th race win of 2010 for a JCM Racing built chassis. Shawn gave special thanks to his win to JCM Racing, NGK spark plugs, and G and C Pro Trans. More photos here in Shawn Gallegher's photo page. Aug 27 8.50 Videos here. Aug 13 8.50 Videos here. 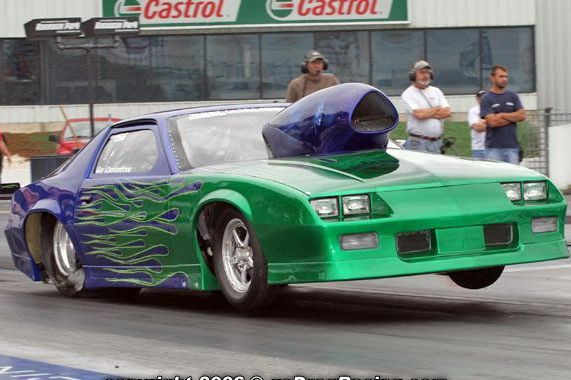 June 19, 2010 Shawn Gallagher Wins at Island Dragway! 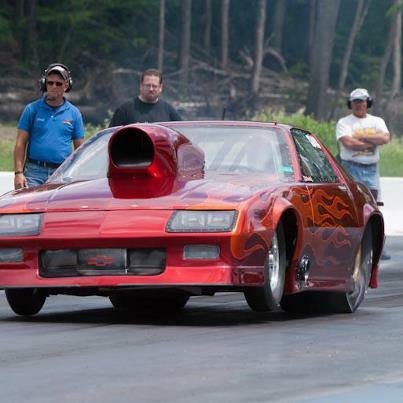 Another Win in 8.50 for Shawn Gallagher at Island Dragway in Great Meadows New Jersey. Shawn ripped the field with runs of 8.59, 2- 8.54's, and a 8.55. 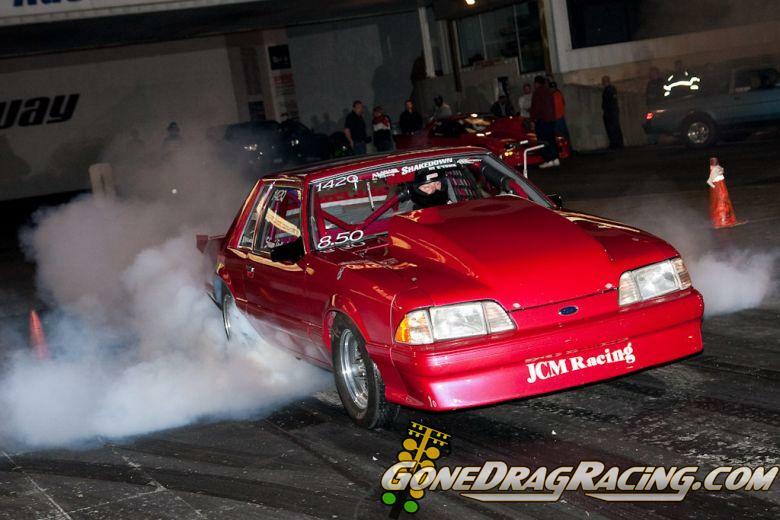 Shawn tuned his way to another win with driving skills, consistant lights and his JCM Racing tuned chassis. That's 3 wns in 6 races for Shawn and the 7th race win of 2010 for a JCM Racing built chassis. 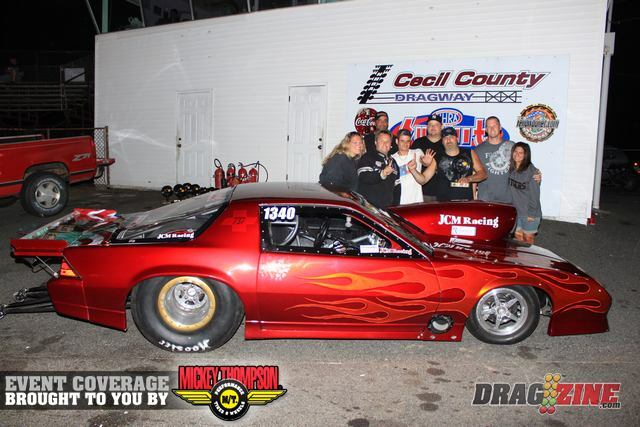 Shawn gave special thanks to his win to JCM Racing, NGK spark plugs, and G and C Pro Trans. More photos here in Shawn Gallegher's photo page. 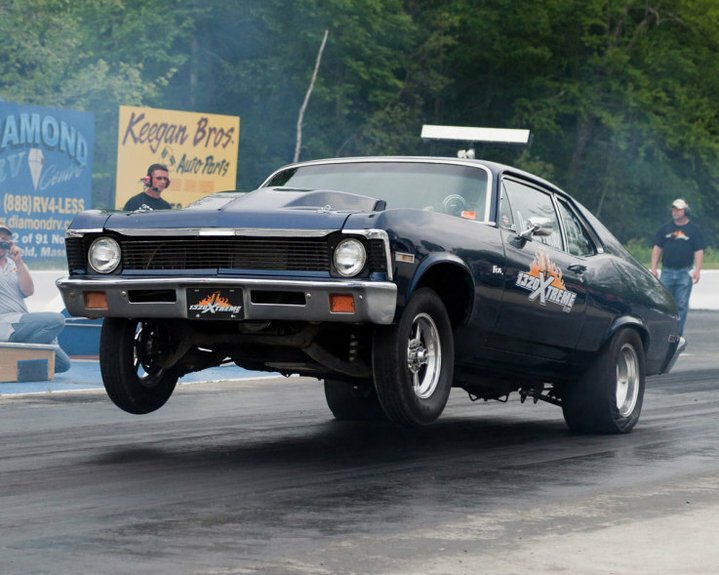 June 19, 20 Chris Kraft Wins both races at Numidia Dragway this past weekend! Chris Kraft use his new 4 link chassis by JCM Racing and considerable driving skills to win both races at Numidia Pa dragway. 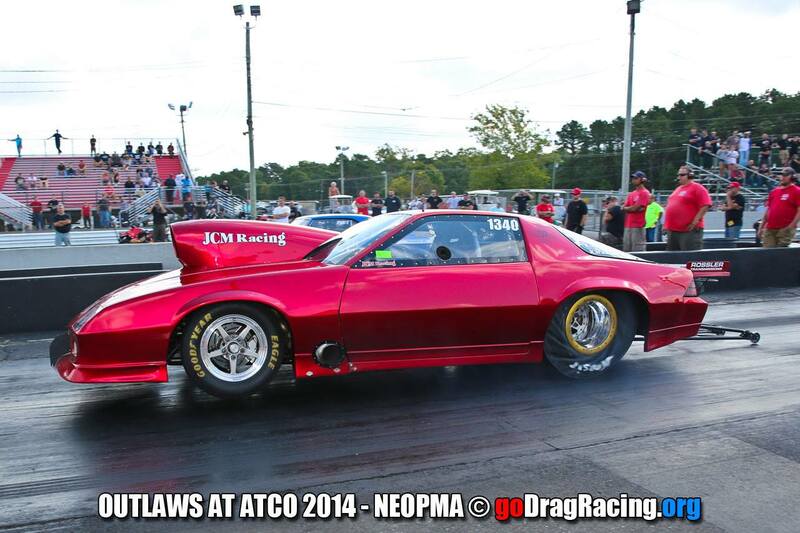 Chris was able to outrun and out drive all the top drivers in the NETO racing organization. Winning on holeshots and near perfect runs of 8.76 on 8.75 dials. Chris won on Saturday, then continued to win on Sunday. 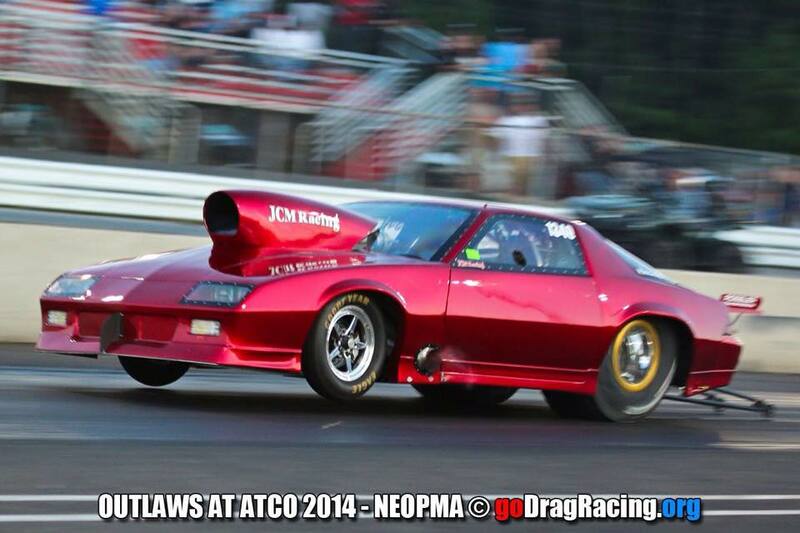 Chris uses a 598 and 4 speed lenco, with a new 4 link tuned chassis and race setup by JCM Racing. Crew Chief Ben "doylie" Doyle hard work kept the car on track and consistant all day with help of assistant Debbie Sloat. Chris gave special thanks to his double win to Debra Benett and the crew for all there help and support. More photos here in Chris Kraft's photo page. 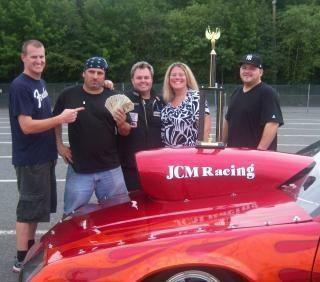 Shawn Gallagher wins again and again with his JCM Racing Mustang at Raceway Park NJ. Shawn started 2010 where he left off in 2009, winning! 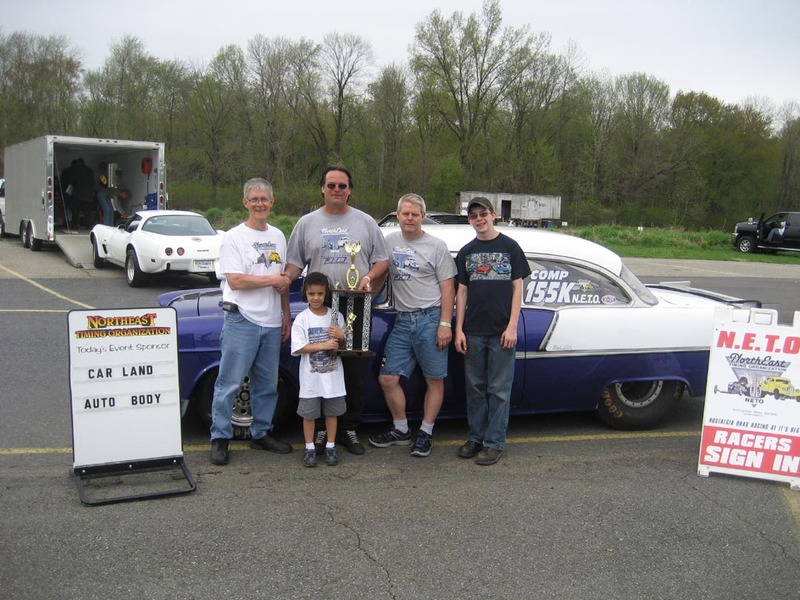 With lights from .029 to .014, and runs within three hundreds of a second of 8.50, he was able to stitch together another win for the family team. Crew Chief John Gallagher tuned the engine to this win and was pleased with the performance of the car and team. 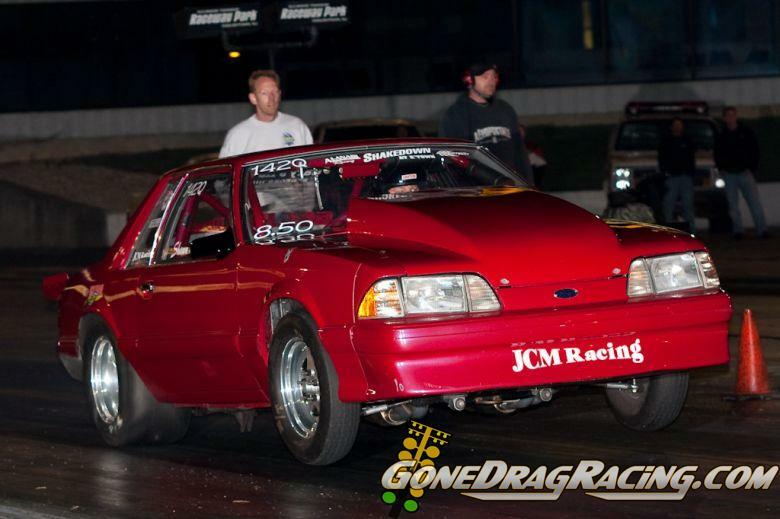 Shawn would like to thank his sponsors, and JCM Racing for chassis tuning, NGK spark plugs, and G and C Pro Trans. More photos here in Shawn's race winning photo page. 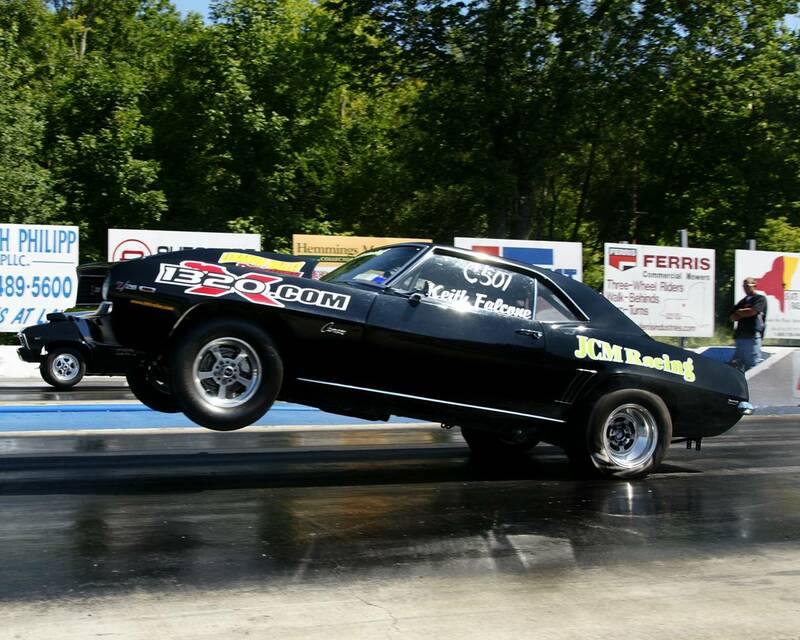 Danielle Falcone recently took delivery of her new "stock" suspended 4130 cage JCM Racing built Nova and put it through some rigorous testing at Lebanon Valley dragway. 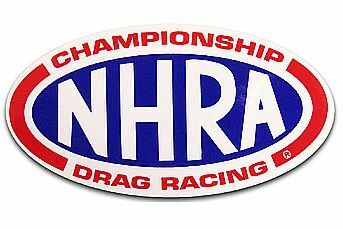 They Plan to attend the next NHRA Unleashed race in National trail Raceway in Ohio. More photos here in Falcone family Racing photo page. Shawn Gallagher wins again at Raceway Park NJ. Shawn's superior driving with a string of .020 lights noting an .01 in the final, along with his brother Johns tunning skills put another check, trophy and win for the Gallagher brothers. 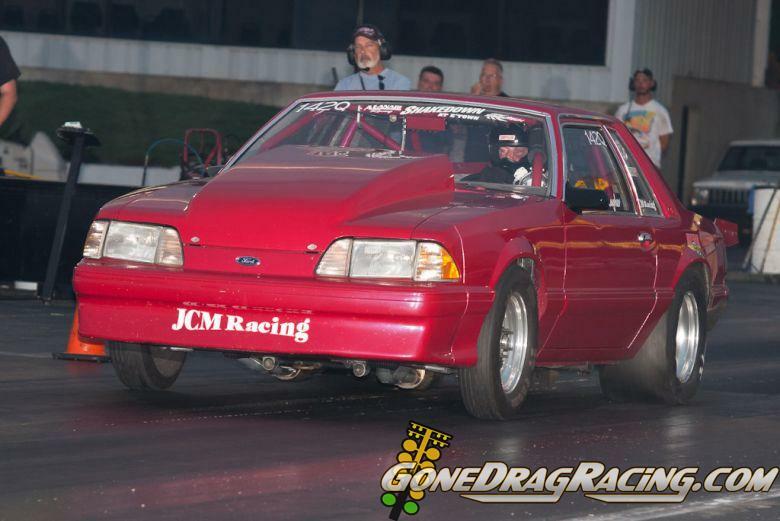 Winning on holeshots and near perfect runs, Shawn was able to put the JCM Racing Built Ford Mustang in the winners circle again. That's three wins and a second place for shawn in 8.50 competition all over the northeast along with his win at Lebanon Valley this season! More photos here in Shawn's race winning photo page. 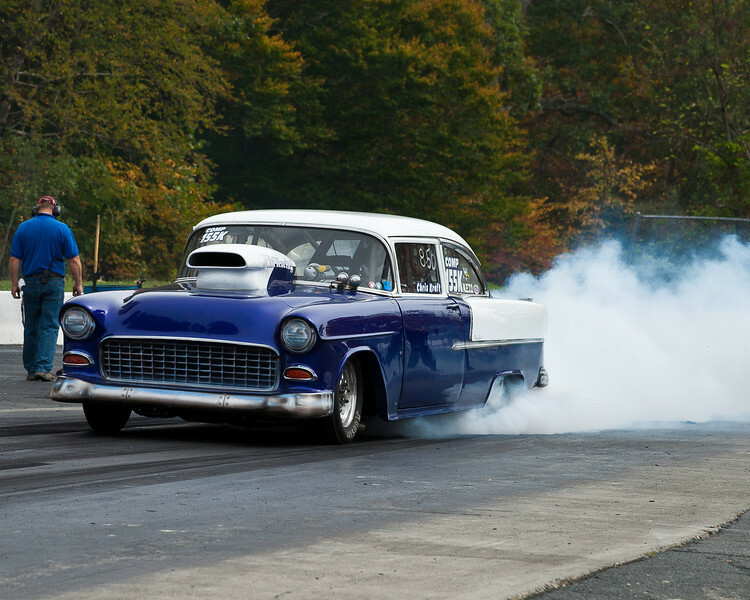 Chris Kraft wins again at Numidia Dragway and At Skyview dragway in convincing fashion. 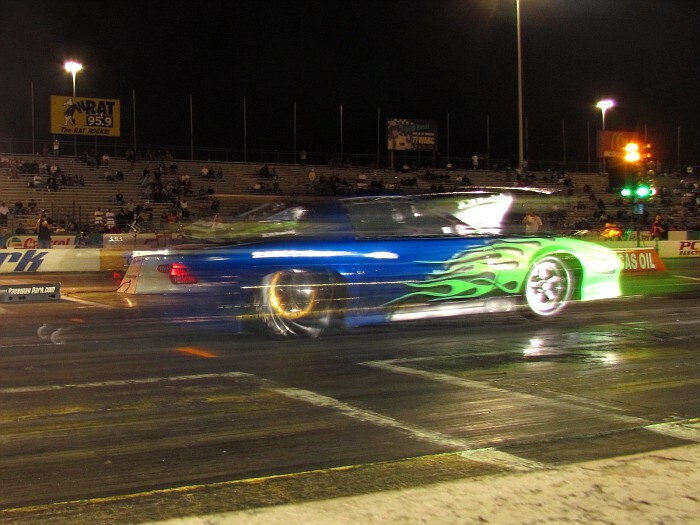 Chris was able to outrun and out drive all the top drivers in the NETO racing organization. Winning on holeshots and near perfect runs, Chris was able to put the beautifully painted JCM Racing 55 Chevy in the winners circle again. More photos here in Chris Kraft's photo page. Kieth Falcone runner up in the ARM DROP LIVE competition. More photos here in Keith Falcone's photo page. First look at Gus Constantinou's new custom paint completed onthe JCM Racing big tire / 10.5 tire 25.2 chassis car. Gus Mixed his custom colors in house at Gus and Nick's Auto Body located in Yonkers New York. These less than professional Photo's dont do justice to the perfectly coated car. It's a must see. Gus will pilot this car in select big tire, and 10.5 tire races in 2009. JCM Racing will be there to tune the chassis/engine combo. More photos here in Gus's 2009 custom paint page. 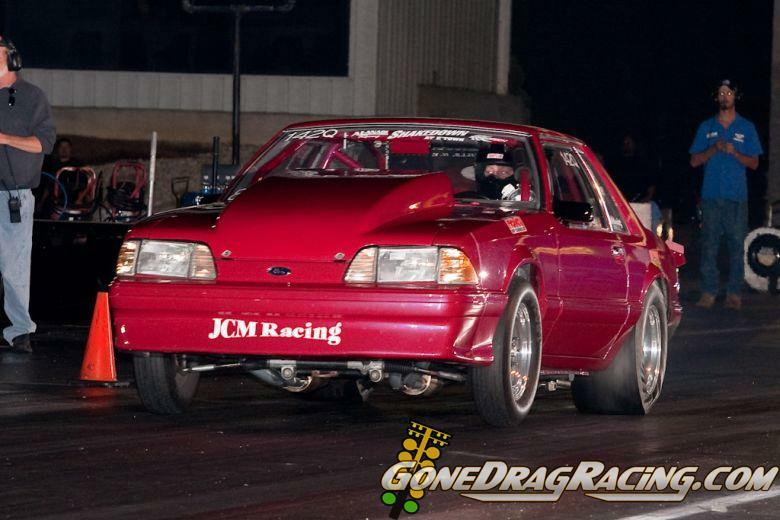 New for 2010 is a JCM Racing designed, and built Mustang Pro Modified car which will run selected North East Outlaw Promod events and NHRA's A/PM in Comp Eliminator. 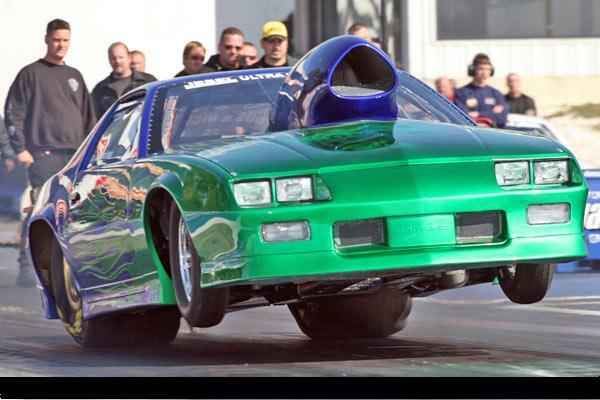 JCM Racing will build every piece of this car in using the NHRA pro stock legal body. With the Body and chassis and interior completed, the car is coming along and will be ready shortly for testing. 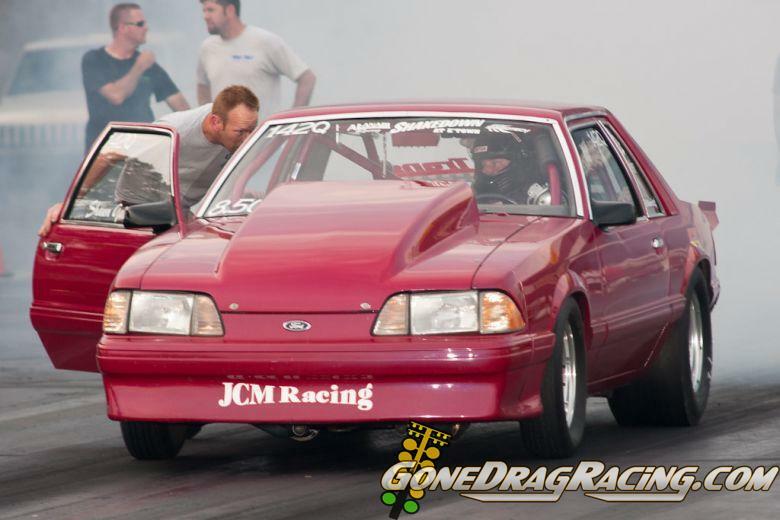 More of the car can be seen here in the JCM Mustang Photo Page. 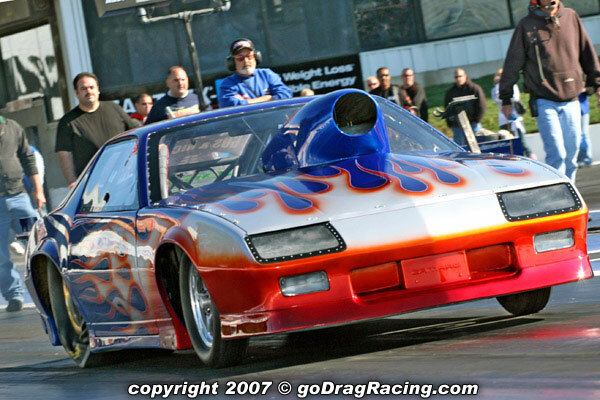 John Cerbone drove the JCM Racing Outlaw Heavy Street car in the 2008 Shakedown at E-Town. 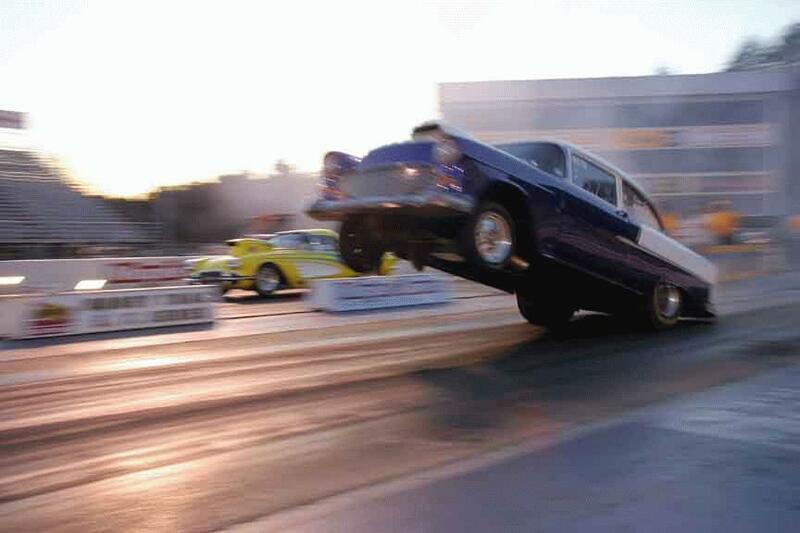 The car was awesome with runs from 7.24 to 7.14 at 198 MPH. 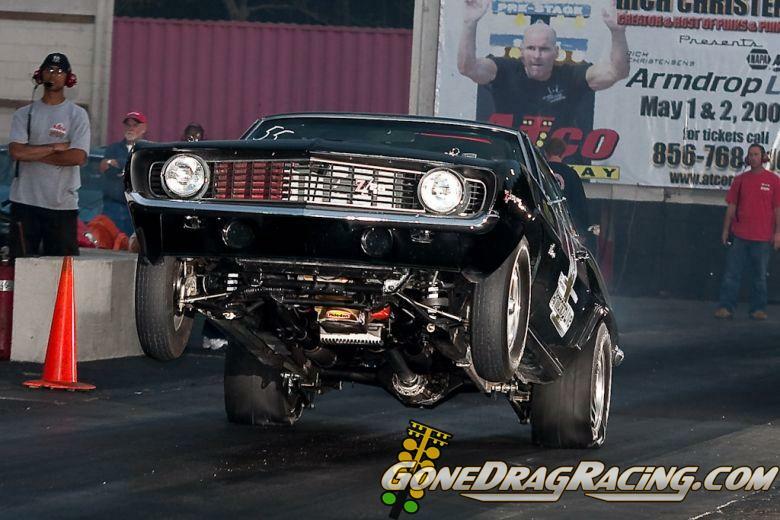 Gus Constantinou again tuned the Camaro to super fast runs at the heavy street rule weight of 3150 lbs. Qualifying 12th utilizing only 2 of the available 3 runs. 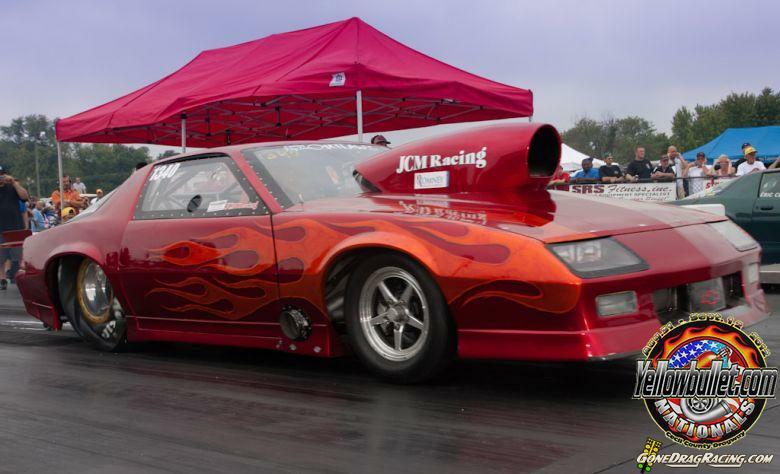 John went three rounds in competition before a faulty nitrous bottle valve forced the Beautiful Camaro to the trailer. The valve froze and though crew members worked quickly on the valve, it could not be opened forcing the run to be done on only one Speedtech nitrous system. 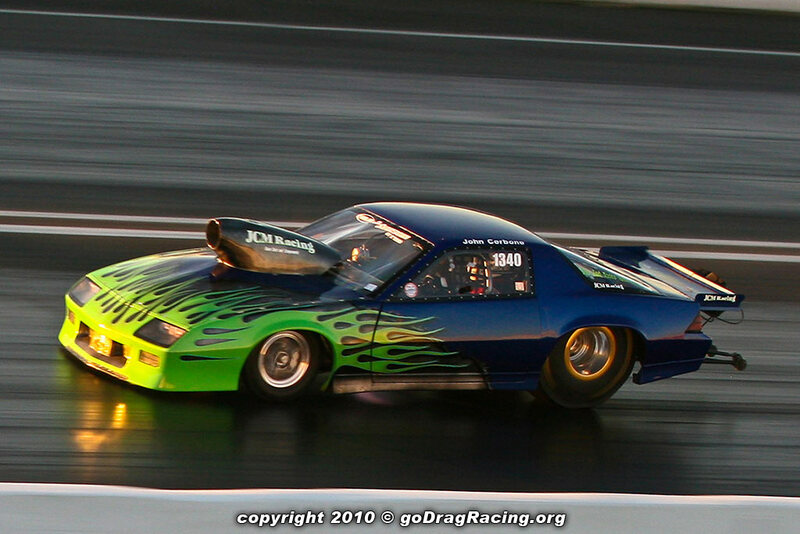 John left on the other driver and Drove the car to a 7.50 run but it was not enough for a better 7.36 in the other lane. 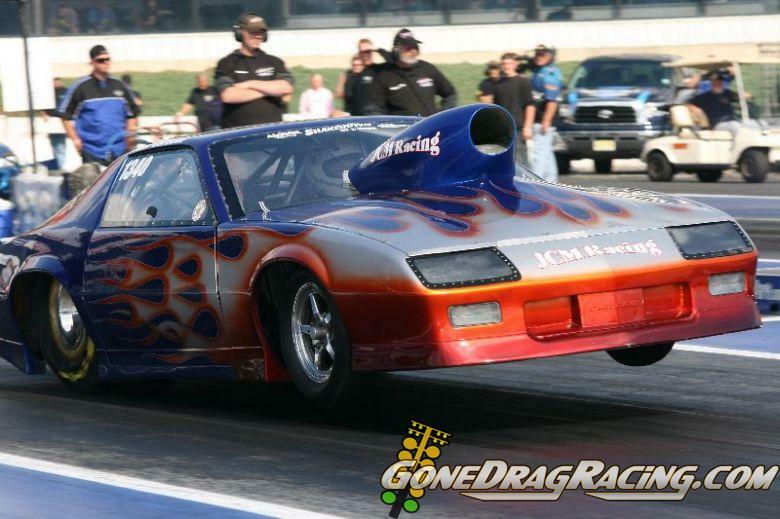 Keith Falcone drove the JCM Racing NMCA Mean Street car in the 1320X competition on saturday and sunday August 16, and 17. 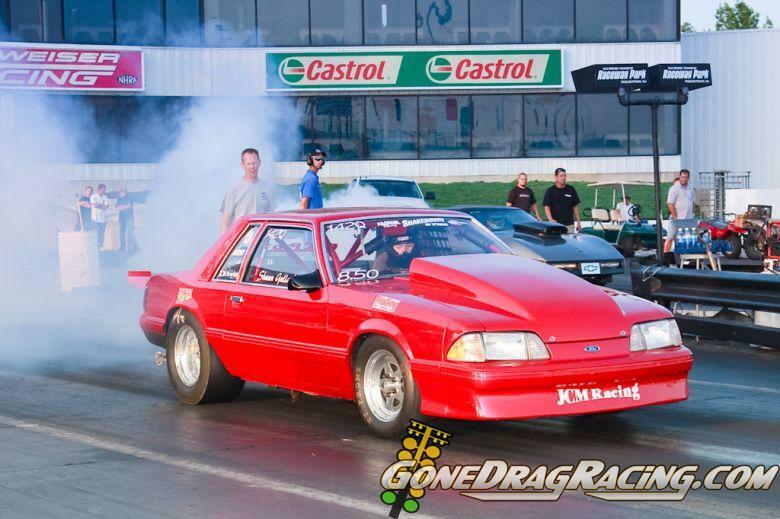 The car was once again dead on with runs of 10.09, 10.10, 10.12 and 10.11 on 10" street tires and stock style suspension. Keith had 4 grudge runs at the 1320X and won every race! Congratulations to Keith, Robert and Danielle. Keith Excited the crowd with giant wheel stands while wining all 4 races. John Cerbone drove the JCM Racing built Robert and Danielle Falcone owned and tuned NMCA street car in the PINKS ALL OUT competition on friday and saturday July 25th, and 26th 2008. 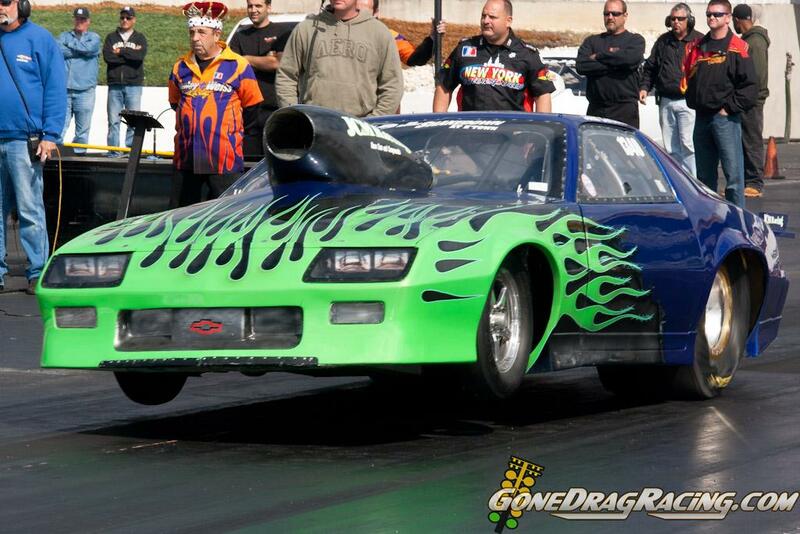 The car was dead on with runs of 10.06, 10.04, 10.03 and 10.05 on 10" street tires adn stock suspension. But the class chosen from the 450 plus participants was around a 9.60 to 9.70 class. We did participate in the pinks wheelie contest and had a good time. photos and video right and below. John Cerbone drove the Stan Coleman owned all black 25.2 chassis, 10.5 Outlaw class Camaro and put the JCM Racing race car in the field in it's very first quick 8 race. The team ran some respectable low 7 second times in the brutal heat and qualified 5th. A First round loss allowed to team to do some more testing to fix the intercooler woes we have been experiencing with this fairly new ride. 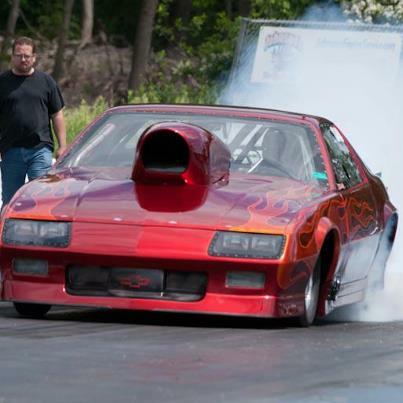 John Cerbone drove the JCM Racing tuned 25.2 chassis, Gus Constantinou owned Camaro to a 10th place qualifying effort in the Big Tire Heavy Street class within the Shakedown at E-town race held at Old bridge Township Raceway Park. Low 7 second runs at over 191 mph were common. Full Story in the news section. 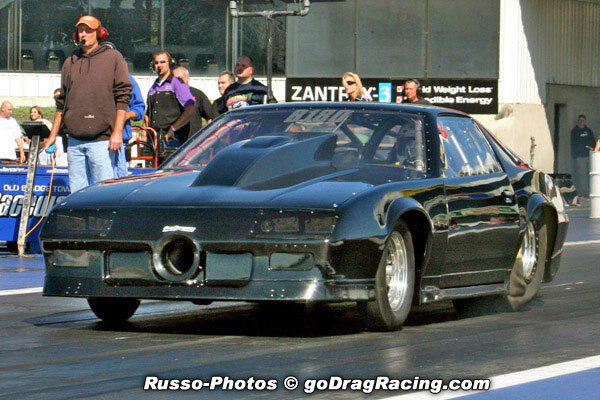 John Also drove the Stan Coleman owned and tuned all black 25.2 chassis, Outlaw 10.5 class Camaro doing double duty. And put the brand new JCM Racing built race car in the field in it's very first race in only it's third run down the track. The team struggled with a less than adequate clutch assembly but pulled it together enough to run a 7.36 at 197mph. Full Story in the news section. 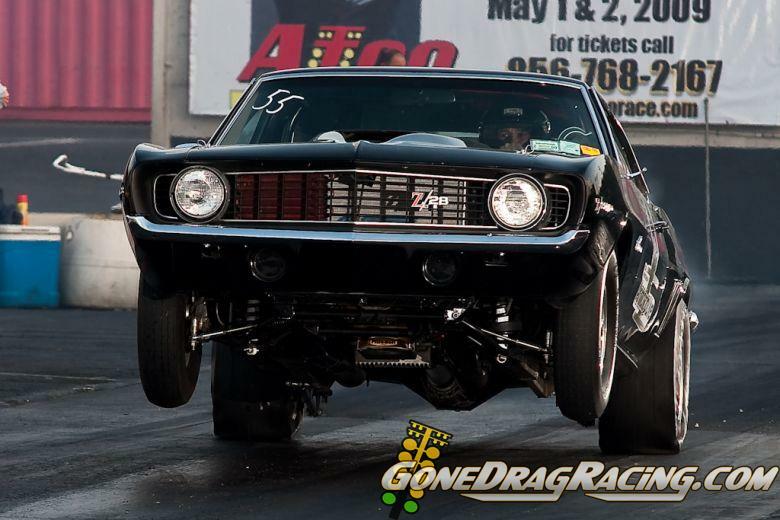 John Cerbone drove the Gus Constantinou tuned Camaro to a 6th place qualifying effort, then semi-final round appearance before shaking the tire enough to slow the car eliminating it for the day keeping the camaro from the final round. 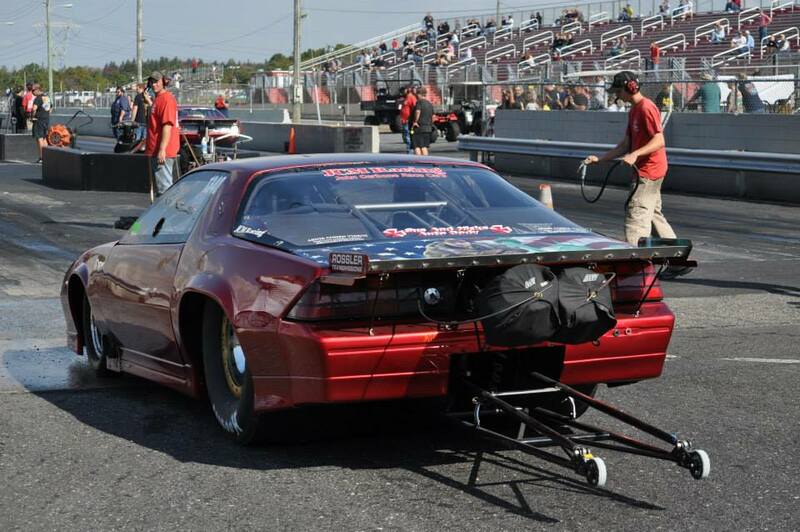 Best run for the weekend with this 3000lb Outlaw car was 7.263 at 191.73 mph. Still with the same 598 and 250 shot of nitrous. 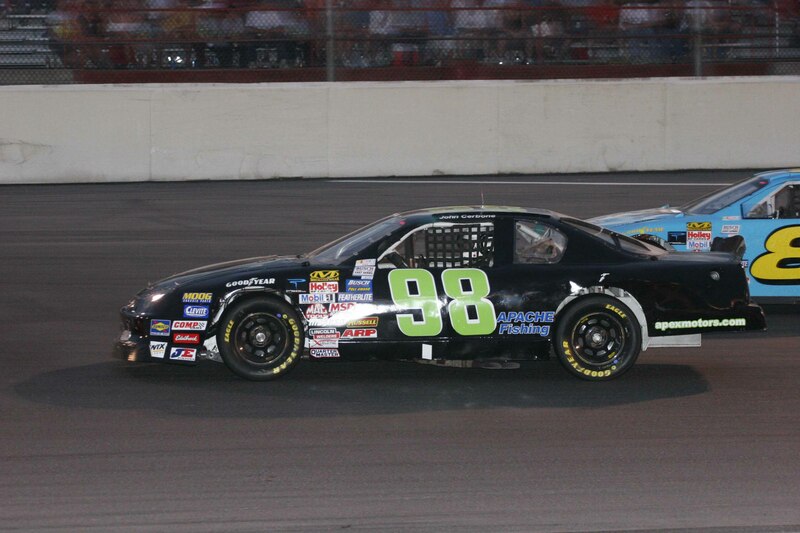 The Team ended up 8th in Quick 8 Points at Raceway Park for the 2007 points season with a limited schedule. Full Story in the news section. 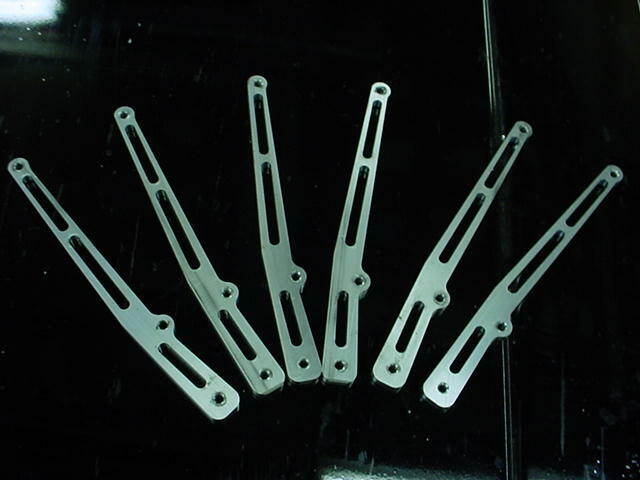 Many different parts, Engine, Chassis and more. / Click here and we'll send you a FREE Digital Print of the JCM Racing Stock Car.